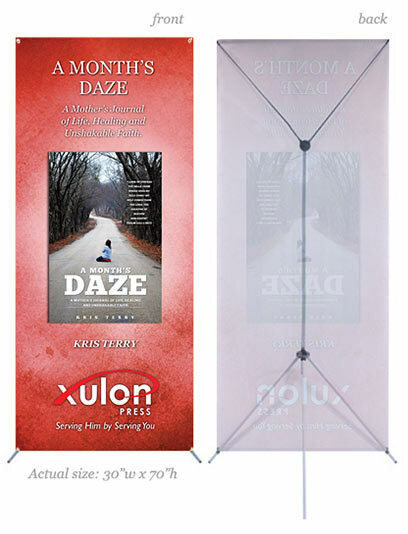 Increase the exposure of your Christian book with a full-color, professionally designed banner. The full-color banner design features the book’s title, a large cover graphic, and the author’s name. The banner has grommet holes which allow it to not only be used on the included stand but also hung from the ceiling or used in a window display. The dimensions are 30″w x 70″h. The Grasshopper adjustable banner stand is made of sturdy aluminum construction. It has 4 hooks on each end of the X shape for very easy set up and take down. Soft rubber feet give the stand a more finished and professional look. As the stand is height adjustable, tension can be applied to the graphite poles to give your banner a very tight, flat, clean look.